Designed for continuous operation: Ideal for larger homes, irrigation systems, tight installation clearance issues, and geothermal applications. 304 Stainless Steel Check Valve 1"
304 Stainless Steel Check Valve 1 1/4"
304 Stainless Steel Pitless Adapter - 1"
304 Stainless Steel Pitless Adapter - 1 1/4"
Simple, fast sizing and installation. Range curves and selection charts generated from actual R&D tests. 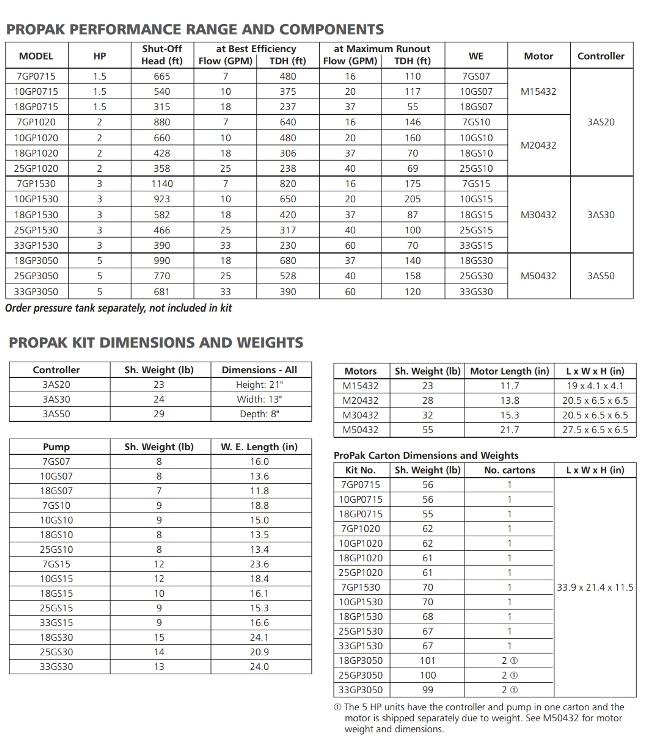 Kits configured for 30 Hz minimum and 80 Hz maximum operation. Pressure is factory preset at 50 psi with simple, fast, field adjustability for higher pressures. Three phase output to motor reduces wire cost. Goulds model GS features the Guardian bearing system and field proven sand and abrasive handling floating stack design. New – a Switch Input for connecting a pressure switch or float switch. New – Grounding provisions for transducer and transducer cable. Everything you need to install your constant pressure submersible pump system. All in Stainless Steel! This 1" #304 Stainless Steel Pitless Adapter has a large gasket for more efficient sealing on the well casing, and also uses a chamfered slide for easy installation. This 1.25" #304 Stainless Steel Pitless Adapter has a large gasket for more efficient sealing on the casing, and also uses a chamfered slide for easy installation. 6" Cast Iron Watertight Vermin Proof Well Cap. The torque arrestor is used to prevent motor start up torque from thrusting the pump against the side of the well casing. Think of it as a shock absorber for your well system. Placement: The torque arrestor should be placed 1' or 2' above the pump. . Installation: Place the torque arrestor around the drop pipe so that each half is spaced evenly. Install the lower pipe clamp and tighten. Install the upper pipe clamp (leave loose) and then push down on the torque arrestor to spread the center portion so it fits the inside of the casing. Just a snug fit, do not spread it so much that it is hard to get it in the casing. Then tighten the upper clamp. It is very important that the upper clamp is as tight as possible. This will make it easier to remove the pump at a later date. A low priced guide with a snap-in feature for installing the pump cable. Fits 6" wells, tabs can be cut for 4" to 5". For 1" Poly Pipe. It is recommended to install for every 25 feet of wire. Professionally and securely seal your 10,12, or 14 gauge well wire connection splices. 4 crimps and 4 shrink tubes included. Perfect for 3 wire pumps plus the ground wire. Ideal Tridon Hi-Gear® Stainless Steel Hose Clamps for 1" Poly pipe. Ideal Tridon Hi-Gear® Stainless Steel Hose Clamps for 1.25" Poly pipe. Cold resistant, flame retardant, electrical tape. 3/4" x 60' , UL Listed. Distance from service entrance to motor 345 ft. 551 ft. 872 ft. 1357 ft. 2163 ft. 3434 ft.